Producer and designer discuss the newly announced game. Dengeki PlayStation this week has first details on the newly announced Sword Art Online: Hollow Realization. How are the action elements compared to Lost Song? Hirayae: “You’ll fight and raid using a skill palette, and there are a number of management elements where you can direct your party members and such. One of the main features of the system is how these action and management elements coexist. Unlike Hollow Fragment, this time, you can take along up to three people. 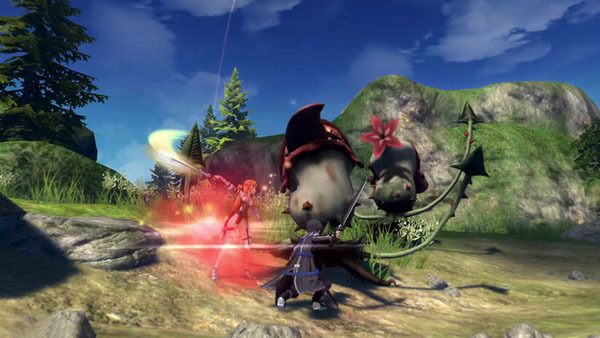 For example, one person could raise the toss, the second person could use a sword skill, the third person could restrain the enemy, and finally Kirito can deliver the finishing blow. The PS Vita version will likely have a touch-enabled skill panel. There are plans for online multiplayer.